I woke up this morning with the sun shining, and the residual of my advil pain- and thus the the remnants of a pounding headache. I am convinced it is stress related. I am seeing my dad today, and that always affects me. I am @ 108lbs and it is not water retention. Not a day goes by without someone assuming I'm pregnant. I've put on so much abdominal fat lately, and steadily that I barely notice the difference on a daily basis until I stop to really look and compare pictures. YIKES. Still wanting to go get a blood test, and check my cortisol levels, blood sugar, blood O2, liver enzymes, iron, b12, potassium, electrolytes and thyroid! I'm just paranoid with doctors and hate going. The only place remotely near me that is a walk in is the 'urgent care' center in downtown. They told me I could be waiting for 4+ hours because it's obviously based on priority of sickness etc. I am currently trying to get psyched for the gym, and am failing miserabley. I am drinking my morning Xenergy (mango guava today) with a bit of Gaspari SuperPumped 250 thrown in and a bit of Prairie Naturals new "Rise and Shine' morning lemon flavored powder with aloe, and minerals. I also took my multi, extra B, today I decided to use my 'SlimQuick Extreme' (for energy) and 4mg ephedrine (again, energy and pain). I think I"m going to use Cytolean tomorrow (Gaspari- steady clean energy- love it!) and I have a sample of the NEW thermo from Nutrabolics (very impressed with their new products) called Hemodrene. I was supposed to have today off from work, but since my dad screwed everything up and I left early yesterday due to feeling so sick from all the burnt smoke coming in through the vent, I asked if I could come in for a bit this morning instead. I am going to load up on bell peppers and hopefully go by T&T's asian market for bamboo shoots (I eat 1-2 cans a day). 230pm- So far my day has been fantastic! I had a nice breakfast, didn't feel light headed (don't know if it's because of the Gravol ,or bc I"m getting better?!) had a nice workout, work was laid back and now I am waiting for my dad to take me to grab some groceries. I had my instant cereal with protein this morning, bran crackers, bag of carrots, can of wax beans and bamboo shoots. I also had 1 scoop of BioX's Power Whey Isolate in Chocolate Peanut Butter (my favorite brand). If I do well I am going to make protein cheesecake using Allmax's Isoflex Protein. 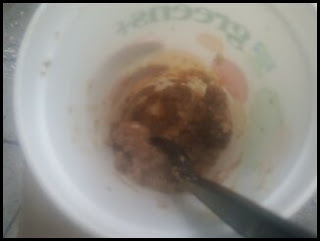 This is the remainder of my instant cereal with protein and bran stirred in from this morning. So yummy!!! It was about 3/4 full. Only 3 more days until the weekend! Came in the mail today!! !